When The boys turn into girls.... . Wallpaper and background images in the Liên minh công lý trẻ club. DIBS ON BEING THE GIRL ROBIN!!!!!!! MWA HA HA HAAAAAAA!!! lol and ist it just me or would aqualad be a really good looking girl? wouldnt he be? but i really like the picture. I like speeds outfit the best! !It looks awsome!!! is it me, or do they not really look like girl that much??? Oh yj fans! How niave you can be when obsessed. I will not claim BEING Robin becaue I claim HAVING that girl Robin! See, if that's azn alternate universe, my gender would change too. Therefore, no matter how you look at it, I will still get Robin!!! XD HAHAHAHAHA! I WIN!!!! My brains finally came in handy!!! Take THAT! HAHAHAHAHAHAHAHA!!!!!!!!!!!! I WIN!!!!!! I AM SUPERIOR~!!!! THANK YOU BRAIN!! And they have a fanfic where Robin gets turned into a girl and there's a little Bird Flash action. But i didn't know if that counted!!! When r u posting urs!? I must know!!!!! Umm...When I get the first part done so...maybe in three days to a week? It all depends on inspiration! XD! Does my hestiantcy cause you to feel whelmed? and nice word play. extra fdan points!!!! YES! I AM ASTEROUSLY WHELMED! i like how you all steal MY idea. Psh, i don't care. Probably would've put it off and never finished it. So whoever's writing it must tell me when its finished. Deal? btw, I called dibs on stealing ur idea 17 comments ago. tee hee XD and trust me, the secind it gets out Im reading it, then ur ALL gunna know, cause i'll SPREAD THE WORD!!!!! Hey Im a girl and Im gonna say dat I really didnt like aquadude when he was in guy form but I think that I would be good friends with him... uh her... in girl form I think I would also be friends with Super boy uhh... Girl? (wait there already is one...) and girl robin I think I would be an aquantance with speedy/red arrow girl and girl KF would just be annoying but funny comic relief. ...True. But AquaLass and this SupoerGirl would probably be too quiet for my taste; I need hilarious and chatty people!!! So Robin, Kf, Red Arrow, would be up my alley!!! o.o SUPERGIRL LOOKS LIKE Y SISTER!!! Cartoon network should do a gender bender episode!!! Superboy and Robin look the best! nice job! keep up the great artistic work! 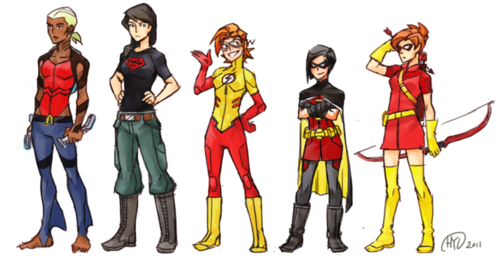 They look like tomboys to me but i like speedy the best in this pic. Wat r their names now?